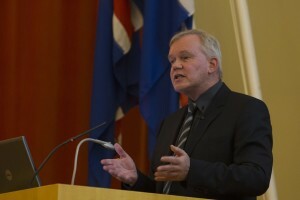 Professor Hannes H. Gissurarson, a member of the RNH Academic Council, gave a paper in the Hall of Ceremonies at the University of Iceland 19 February 2013, called “Liberty, Crisis and Capitalism”. He said that recent reports of the demise of capitalism were greatly exaggerated. According to the Index of Economic Freedom, on average economic freedom had not decreased in the last few years. The really big news in the first decade of the 21st century was that China and India had joined world capitalism, 2.5 billion people. Then, Professor Gissurarson turned to four arguments against (classical) liberalism and capitalism. The first argument was that capitalism was unstable, subject to economic fluctuations or business cycles. Gissurarson agreed that capitalism was not “depression-proof”, but pointed out that government was the source of much more instability than capitalism. The financial crisis of the last few years was mainly caused because excessive risk-taking in the financial sector was encouraged. If you won your bet, you pocketed the profit. If you lost, you passed the bill on to the taxpayer. New financial techniques had been supposed to spread risk more widely, but instead it worked to obscure risk. It was obviously wrong, also, to regard real estate and government bonds as almost riskless assets. Moreover, banks had been legally prohibited to form large funds against possible losses. The second argument was that the Icelandic “neo-liberal” experiment had failed. Gissurarson replied that no “neo-liberal” experiment had been conducted in Iceland: in 1992–2004 the economy was simply brought closer to that of the neighbouring countries which meant increased economic freedom. The 1991–2004 period was that of market capitalism, but the 2004–2009 period that of crony capitalism. In 2004, a small group of adventurers had basically taken the Icelandic economy over, hiding its reckless debt accumulation behind several names and identification numbers. Thus, to the systematic undervaluation of risk in the international financial sector, there was added a systematic undervaluation of risk specific to the Icelandic economy. The third argument was that liberalism was inhumane. According to Gissurarson, this argument was based on ignorance about the real message of classical liberals such as John Locke and Adam Smith. There were basically two ways of getting those things which you covet from your neighbour: either by force or by offering a mutually acceptable price. Liberalism was about the second way. Moreover, capitalism has proven to be the most effective mechanism developed by mankind to turn poverty into affluence, and thus to eliminate many of the worst problems of life. The fourth argument was that the Icelanders should follow the European rather than the American model. Against this, Gissurarson argued that the United States was by no means a free-market utopia; it had only the 18th freest economy of the world in 2010. Switzerland was the country in the real world which came closest to being organised on liberal principles, not only because of its relatively free economy, but also because the possibilities of one group coercing another one were severely limited. However, Gissurarson found it interesting that living standards in three “Nordic countries” in North America, namely South Dakota, Minnesota and Manitoba, were better than in the four Nordic countries, namely Denmark, Sweden, Iceland and Finland (excluding oil-rich countries in both groups). After the lecture, Thorolfur Thorlindsson, Professor of Sociology, asked how the Icelanders could get out of their present quandary. Gissurarson responded that it was essential to reduce taxes in order to stimulate the economy. Asset manager Gunnlaugur Jonsson asked which kind of a monetary system the Icelanders should adopt in the future. Gissurarson pointed out that the problem was irresponsible behaviour, living beyond your means, not really the monetary unit. If the Icelanders had sufficient self-discipline to live under, and adjust to, an external monetary regime, then they would presumable also have the self-discipline to do without it and to manage their own currency. However, it was necessary to keep an open mind about this issue, and if the Icelandic crown was abolished, then one interesting possibility would be a currency board with the English pound as the monetary unit. 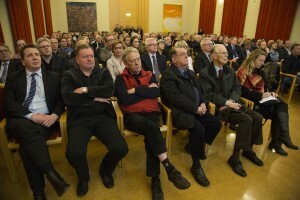 While the well-attended lecture was held by the Institute of Public Administration and Politics at the University of Iceland, it formed a part of the lecture series organised jointly by RNH and AECR, the Alliance of European Conservatives and Reformists, on “Europe, Iceland and the Future of Capitalism”. The meeting was chaired by Professor Omar Kristmundsson, president of the Politics Department. 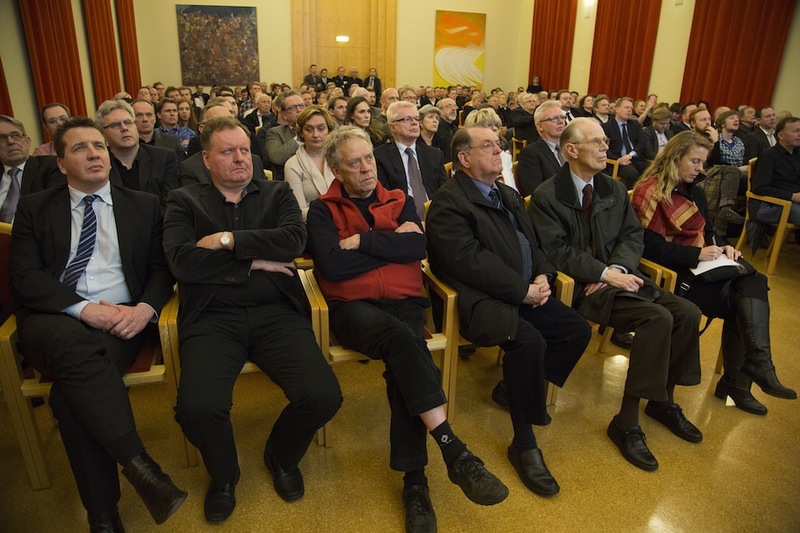 After the meeting, Professor Gissurarson invited the audience and many others guests to a reception in the University Canteen, on the occasion of his sixtieth birthday the same day. The reception was directed by City Councillor Gisli Marteinn Baldursson, with Professor Kristmundsson and Bjorn Bjarnason, former Minister of Justice, giving short talks, and a jazz band directed by P. E. J. Gunnlaugsson performing. In the evening, friends and colleagues of Professor Gissurarson held a dinner in his honour, the organising committee being the RNH board, Gisli Hauksson, Jonmundur Gudmarsson and Jonas Sigurgeirsson. Kjartan Gunnarsson directed the dinner, and the main speech was given by David Oddsson, editor of Morgunbladid and former Prime Minister of Iceland. Morgunbladid gave an acount of the lecture 20 February 2012. It was also reported in an online student magazine. Styrmir Gunnarsson, former editor of Morgunbladid, said in his weekly commentary 22 February 2013 that finally, with Gissurarson’s lecture, the silence of the academic community about the Icelandic bank collapse, its causes and its consequences, had been broken. Professor Gissurarson discussed the content of his lecture in a television interview with Bjorn Bjarnason 27 February 2013 at INN-station. On the occasion of Gissurarson’s 6oth birthday, Morgunbladid published an analysis of his origins and career, and an interview with him as well. Vidskiptabladid also published an interview with Gissurarson 16 February and a photo series of his birthday party, as well as an interview on its Internet television. The weekly entertainment magazine Sed og heyrt also published an interview with Gissurarson, with photos from his 30th, 40th, 50th and 60th birthday parties.